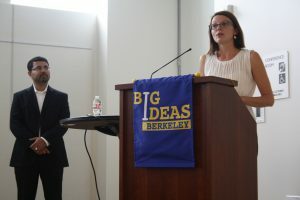 Having nurtured their “big ideas” since September, six of the most innovative finalist teams in the Big Ideas@Berkeley contest presented their projects to a panel of distinguished judges at the Big Ideas Grand Prize Pitch Day on April 25, 2013. Pitch Day contestants had the opportunity to win up to $5,000 in prize money to support their project. Winning teams will add their Pitch Day prizes to awards in their respective Big Ideas contest categories. Judges awarded the Grand Prize in the Global Impact Pitch Round to The Pachamama Project, the big idea of Rebecca Peters, Lindsey Dreizler, and Jessica Kretch. Their initiative promotes gender equity, education, and access to clean water and sanitation in Bolivia while also engaging the stigma around menstruation. The Grand Prize in the Campus and Community Impact Pitch Round went to Cashify, pitched in an energetic presentation by undergraduates Shuonan Chen, Justin Chu, and Virgina Chung. Their big idea is to improve financial literacy, starting on the Berkeley campus. 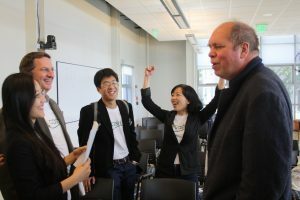 Cashify uses interactive online games that engage students in what the team calls “Edu-tainment” while connecting students to on-campus financial resources. “The pitch gave us the opportunity to personalize our project… to give it a heart, a soul, and enthusiasm,” explained Chen. Finalist teams were also awarded 2nd and 3rd place prizes. In the Global Impact Pitch Round, Emmunify, an innovative project to embed immunization records in electronically readable tags placed on phones in rural northern India, took the 2nd place prize. The 3rd place prize went to Building a Youth Leadership Association in Rabinal, Guatemala, for their project that will empower indigenous teenagers in Guatemala to form their own Youth Leadership Association. In the Campus and Community Impact category, AMASS Media was awarded 2nd place. Their project will use a web interface to connect non-profit and small social impact organizations with early career videographers to increase the impact of organizations while building the portfolios of young videographers. The 3rd place winners behind the UC Berkeley Science Shop similarly offer non-profits, businesses, and local government free or low-cost access to student scientific research on campus—allowing students to impact social change through their on-campus research. The six teams invited to pitch their ideas to judges and the campus community were selected based on on the high scores their written proposals received. The Pitch Day forum not only opens opportunities for additional funding to top contestants, but also gives teams the chance to present their ideas in a personal and visually engaging format—a useful skill for social venture start-ups. “Pitching is essential in any entrepreneurial venue,” explained John Chang of AMASS Media. “You have to know how to talk about your project!” Chang stressed the importance of the Big Ideas mentors in guiding their team through the process of translating their written proposal into an engaging public presentation. Chang feels that it is these types of mentorship and experiences that put Berkeley on the cutting edge of social innovation. The teams also benefited from the engagement with the panel of expert judges in Q&A sessions that followed each pitch. “The judges’ questions challenged us with new perspectives… I appreciated that,“ said Chen.